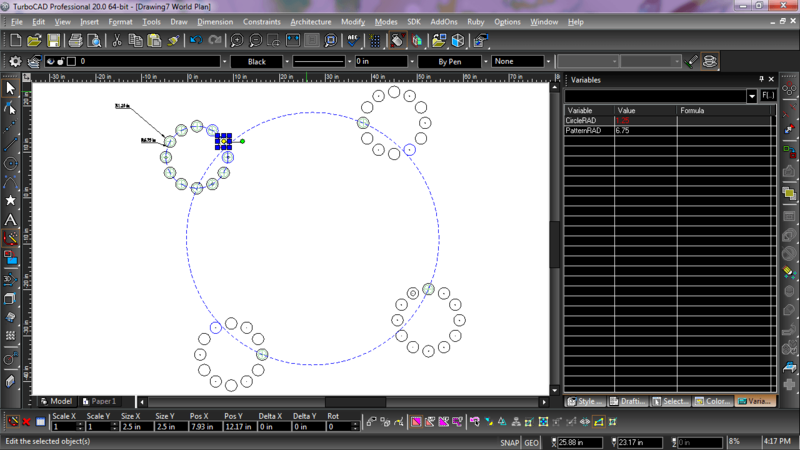 Parametric drawing provides precision and productivity. You have greater control to enforce design intent, and may very quickly modify a design by using geometric and dimensional constraints. The Calculator Palette allows you to set values to driving dimensions, including formulaic relationships between objects, and using any of the functions shown in the image at right. The TurboCAD constraint system includes the D-Cubed™ 2D DCM constraint manager from Siemens Industry Software Limited — This is the same trusted engine used by more expensive design platforms such as AutoCAD®, Autodesk Inventor®; by Dassault Systems for CATIA and SolidWorks®; by Siemens Industry Software Limited for NX and Solid Edge; and by think3® for thinkdesign. Often referred to as variational sketching, constraints allows you to enjoy greater control and productivity, empowering your creativity. You will get more done, create part families faster, incorporate red-line changes more quickly, and have the flexibility to evaluate different designs with ease. Look at what-if scenarios the way you would update a spreadsheet. See the movement of linkages simply by changing a driving dimension. The auto-constrain feature will attach all possible constraints to a selection, or set autoconstrain ON while drawing and relationships will be added as you go. All standard dimension types may be used as driving dimensions. These features allow for dramatic productivity gains when drafting or making revisions. Pattern Constraints are not a specifically defined tool, but use the power of constraints, dimensions, and array tools to allow for parametrically defined arrays of drawn objects. What this means is that you can draw any 2D geometry, turn on auto constraints, and then use any of the array tools to create your array. The relationships between the distances of items, like the dimensions of the items themselves, can be defined by creating variable dimensions. Those variables are then managed by in the Calculator Palette. The variable dimensions may be used to define offsets, separation, angles of offset, and more. This is most powerful when creating designs for mechanical parts where patterns appear -- keyboards, telephone pads, ventilation gaps, and more. The patterns may also be used for laying out parking strips, cubicle designs, or for indicating where upon a surface to later place windows, ornaments or other architectural elements. When an Array Pattern is created, for example, the number of rows, columns, levels, and the distance between items in the array's x, y, or z axis can be modified at any later time.